This design is a pre-order. We expect them to be printed and shipped by mid-May. PLUS! All Pre-orders are eligible to win a prize pack of original Hardcorps / United / Local / Flat Magazine items. Print Run: First print run is limited to only 60 items with this design. Shirt Colors: Black, White, Mystery. Mystery could be any color or pattern, making your shirt even more unique. Print Size: Approximately 10" x 10"
Reuse Garments: Some of the shirts are brand new that were being discarded and other shirts are pre-owned shirts that have been washed, treated and ready for their second life. 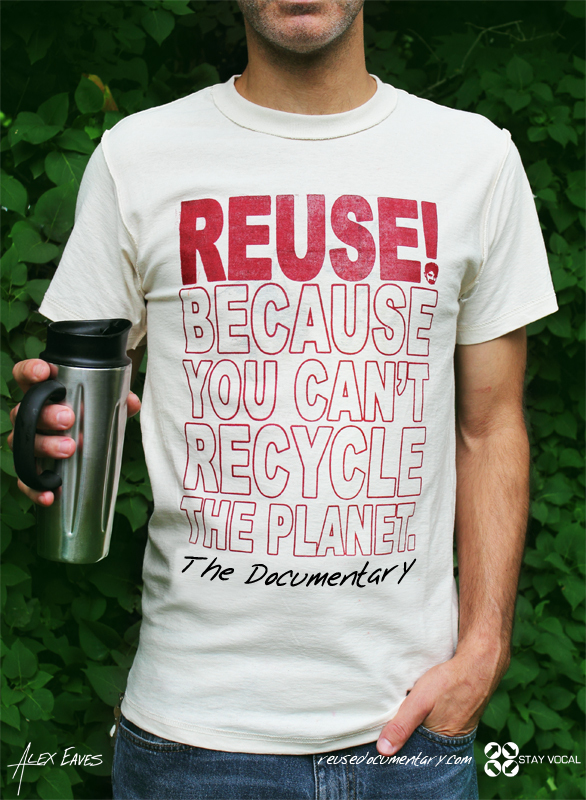 Reuse Style: Some of these shirts are printed on the reverse side (inside out), but sometimes we do use blank shirts. (All of the white shirts are blank). For the inside out shirts, we only use T-Shirts with minimal printing on the outside to prevent any possible discomfort. But as most of us have been wearing ReUse inside out T-Shirts for a while, we can honestly say that you won’t even notice. This design was originally created by Corey Wells for United Skates in 1998 or so. United was the first name used for the skateboard decks made by Hardcorps, Corey's surf and skate shop in Hull, Massachusetts,. The name quickly changed to LOCAL, though, when the United Rollerskate Company felt it was too close to theirs. The "Fall We Not" design was used only for a handful of shirts, but STAY VOCAL's Alex Eaves was the owner of one of them. Alex rode for Hardcorps in the late 90s and he loved the design. He also ended up writing for the shop's magazine, Flat. After Hardcorps closed, Alex and Corey lost touch for a while, as they were on opposite ends of the country. But over the past few years, they've reconnected and stangely enough, they both ended up making movies. Well, being fans of each other's work and sharing the same T-Shirt printer since the 90s, a collaboration was bound to happen. And being Alex's favorite design, the "United Fall We Not." was the design of choice.